I plan on rooming alone, and accept the single-supplement charge. I am traveling alone, but request to be matched with another single traveler, and therefore save the single occupancy charge. I understand that this is just a request, and will pay the single-supplement charge if a roommate is not found. I am traveling with a companion and we would like a double bed or larger. I am traveling with a companion and we would like two beds. I am travelling with a companion and we would like separate rooms. We accept the single-supplement charge for each traveler. A deposit of $300 ($500 for Iwo Jima; other amount for specific tours as indicated!) per person is due to complete your registration and reserve your seat on the tour. It is refundable up to 90 days prior to departure minus a $50 admin fee. At least 50% of your balance is due 90 days before the tour; the remaining balance is due 45 days before departure. Your seat is not reserved until we receive your deposit! Standard deposit is $300 per person. For Iwo Jima the deposit is $500 per person. 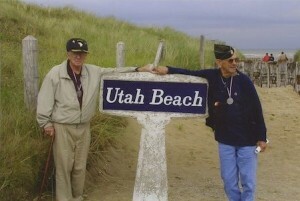 For the WWII Allied March Tour the deposit is $1000 per person. I will mail in a check for $300/$500/$1000 (per person). I will call in with my credit card info. I understand that there is a 3% service charge per credit card transaction, making a $300 deposit a $309 charge and a $500 deposit a $515 charge. Please make checks payable to Stephen Ambrose Historical Tours or SAHT. Are you a World War II Veteran? Stephen Ambrose Historical Tours recommends Traveler’s Insurance. Please contact Travelex at 800.228.9792. Our account number is 18-6016. I acknowledge that I have been advised about travel insurance. Written Notice: All reservations, cancellations, and changes and arrangements must be made in writing. We are not obligated to act on information given via telephone until written notice has been received. Fax and e-mail shall be accepted as written notice. Reservations, Deposits and Payment: To reserve your tour space on the tour, complete the enclosed Registration Form and mail it, along with the appropriate deposit(s) to the address at the bottom of the form. Your deposit is credited against the total tour cost. The cost of the tour is due as follow: Fifty percent (50%) within 90 days of departure; the entire cost of the tour within 45 days of departure. Cancellation and Refunds: We will refund all payments you make for the tour if cancellation is received by us more than 90 days before departure, minus a $50 per person administrative fee. If cancellation is received by us between 90 and 60 of the departure date, you will forfeit your deposit. If cancellation is received by us between 30 and 60 days of tour departure, you shall be responsible for fifty (50%) percent of the tour cost. If cancellation is received by us less than 30 days before departure, you shall be responsible for the total tour cost. Travel Insurance— Important: We highly recommend that you purchase a travel insurance package. There are different travel insurance programs that are available. We believe two of the most important travel insurance provisions are those covering refunds for last minute cancellation and for emergency medical coverage. Medical coverage is especially important if the trip goes outside the United States where many U.S. policies will not apply. We recommend Travelex Insurance and have enclosed an enrollment form and informational brochure for your review. Please note that this is not the only company writing this type of insurance.and you are free to use any travel insurance policy by any company. Currency Fluctuations (for international tours): All prices are quoted in US dollars, and are based on tariffs and exchange rates available at the time of publication. Prices are subject to adjustment in the event of international currency fluctuations, fuel increases or any unexpected increase in tour costs, state or local taxes and/or local tariffs. We reserve the right to cancel a tour if the currency of a country we visit fluctuates more than 15% between the date of your final registration and the starting date of the trip. In this event, you will receive a full refund. Tour Discounts Please note that all tour discounts and other reductions in tour cost must be applied prior to final tour billing (approximately 45 days prior to tour departure). We are not responsible for any unclaimed monies once final billing occurs. Travel Kits: Final trip materials for fully paid participants, including airline tickets (where applicable) and itineraries, will be mailed approximately 30 days prior to departure. Rooms: Our tour price is based on two persons sharing a room (double occupancy). If you wish, we will attempt, but cannot guarantee, to match participants who are traveling alone and who wish to share a room to alleviate the single supplement charge. Should we not be able to pair you with another, then the single supplement will apply. The charge for the single supplement is listed elsewhere. We are not responsible for clashes of personalities in trying to assist individual travelers who wish to share a room. We will endeavor to give each party contact information for the other prior to the trip. Airfare: Participants are encouraged to purchase airline tickets no sooner than 60 days before the tour begins to avoid airline cancellation penalties if a tour is canceled or otherwise modified. SAHT accepts no liability for the purchase of non-refundable airline tickets. Luggage Allowances and Security: The luggage allowance is limited by the airlines to two pieces of checked luggage, with a maximum combined dimension of 106 inches, from international gateway cities in the US to overseas destinations. Since September 11, 2001, airlines have imposed tighter baggage restrictions and more security. Within 30 days of your departure date, please check with our office or with the airline with which you book transportation for any important changes. Tour Participants: In order to ensure the smooth operation of all tours and to ensure congenial tour groups, we reserve the right to accept or reject any person as a tour participant or to expel from the tour any person for any reason who, in our opinion, is not compatible with the interest of the group. Please note that all of our motor coaches are non-smoking. Physicality: We applaud those with disabilities or handicaps who continue to travel. Participants are solely responsible for being in sufficiently good health to undertake any tour and for taking all appropriate medical precautions. We cannot provide medical advice including advice on inoculations or health requirements of particular countries. Participants are strongly encouraged to contact their family physician or Public Health Service for travel health questions. For foreign travel, you may wish to visit the web site of the Center for Disease Control at http://www. cdc.gov/travel. All of our trips require walking and getting on and off motor coaches. Some trips require more strenuous activities. You are responsible for judging your own capacity and to be able to do tour activities without delaying or infringing upon the progress of the trip or the other travelers. If you travel with us, we must know at the time of your registration of any disability, handicap, health or dietary restriction or any condition that may interfere with or limit your tour participation. NOTE to prospective “Corps of Discovery” participants: The “Corps of Discovery” tour includes canoeing (usually three days), living in tents, camping, and outdoor eating and toilet facilities (two nights), and some mountain walking and hiking. Weather conditions may be very hot and humid, cold and/or wet. Please be sure that you are in good physical condition to be able to enjoy and fully participate in the activities of this trip. Passports and Visas: Valid passports are required for all tour participants on international tours. Visas may be required of participants traveling to certain destinations. If visas are required, it is your responsibility to ensure that all completed Visa applications are provided to us in a timely fashion. It takes time to acquire visas for certain countries. We suggest that you make your application at the earliest available date. Failure to complete these requirements may jeopardize your participation in and the forfeiture of your part or all of your tour cost. Responsibility of SAHT: Stephen Ambrose Historical Tours acts only as the agent for the owners, contractors, and suppliers providing services, lodging and transportation in connection with its tours. As an agent, our liability is limited specifically to the conditions assumed by them us in this publication or by other specific contract agreements with providers. We are not responsible for baggage loss or damage. We urge all tour participants to include baggage loss or damage as part of the travel insurance you may purchase. We are not responsibility for losses or additional expenses incurred through delays or changes in flight schedules or transportation service, nor for injury, death, damage, delay or losses due to weather strikes, bankruptcy, quarantine, acts of war, terrorism or civil disturbances, governmental edicts or regulations, acts of God, or any other causes beyond our control. Itinerary Changes & Delays: If the services and accommodations described for a particular tour cannot be supplied due to causes beyond our control, all reasonable efforts to supply comparable services will be made. We take all reasonable efforts to adhere to the published itinerary. However, if circumstances require it, we reserve the right to change or substitute any published plan. We also reserve the right to pass on to tour participant’s additional cost or savings. In General: We are in the travel and tour business. Our aim is to do all reasonably possible within good judgment to see that you have an enjoyable and safe trip with us. Should you have questions, please contact us. I consent to this website storing my submitted information so I can be contacted about my reservation. Can't tell you how impressed I was with the "D-Day to the Rhine" tour. Enjoyed it so much, I can't keep from talking about it. We had so much that we saw it was hard to comprehend but I will never forget it. Tell Ron, Judy and Kevin hello for me. Matterhorn Travel has merged with Stephen Ambrose Historical Tours. Please update your weblinks to https://stephenambrosetours.com and use info@stephenambrosetours.com for all your emails.